New to ANC! These popular 30-minute, fast-paced learning sessions are focused on singular innovations. Trace the path of a big idea from concept to implementation, identifying the steps that will put that idea to work in your operation. 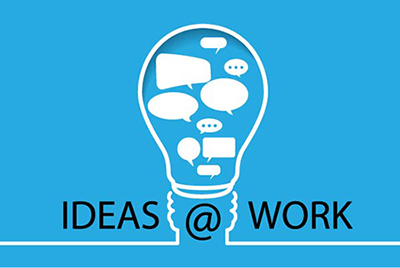 Check back here regularly to find out about new Ideas@Work sessions being added to the ANC schedule. Ideas@Work are sponsored by Tyson Foods. Back by popular demand from #SNIC19! How can your program compete with that #! @* java place? Steam up your a la carte sales with an in-school coffee kiosk. One director will share what does and doesn’t work in terms of menu mix, equipment, stakeholder soothing, marketing strategies and, of course, barista terminology. Come smell the coffee and see what your district is missing. Learn how a school district with long winters and a short growing season established an aquaponic greenhouse to support its farm-to-table priorities. Aquaponics combine aquaculture (raising fish, snails, etc. in tanks) with hydroponics (cultivating plants in water) to grow such foods as lettuce, spinach, herbs, onions, tomatoes, cucumbers and peas year-round. The greenhouse is used to teach students about agriculture and the values of a self-sustaining ecosystem. Be Our Guest... Our Guest Chef, That Is! Your principals, superintendents and board members know that a hungry child cannot learn, and they understand the important role of school meals in the education of their students. But do they know all that goes into making sure your students are well-fed and ready to learn? A "Guest Chef" program gives administrators a hands-on, fast-paced experience on what it really takes to dish out good nutrition! Looking for innovative ways to engage your student customers and connect your school cafeteria to the classroom? Discover how one district worked with the curriculum department to build lesson plans that have been implemented state-wide! From Kindergarten Kitchen Career Tours, to Fourth Grade Farm Festivals, you'll walk away with lesson plan templates and ideas for use in grades K-12. Breakfast in the classroom (BIC) offers unmistakable benefits for school nutrition programs including increased participation, increased reimbursements and reduced stigma for students. However, most educators are unaware of the program's academic benefits. Learn how to speak the language of educators and make the case that BIC helps not only the school nutrition program, but also a school district’s academic success. Cafeterias may not be able re-create the Chipotle model of customizing meals due to limited staff resources and set-up. However, you can still raise the bar and increase participation by incorporating customization stations in your cafeteria. We’ll look at ways to engage students in their school meals using spice bars, salad bars and even a hot chocolate bar! You never want to fire anyone--you want to lead, develop and empower people. Learn how to unify your team through progressive discipline. Progressive discipline gives an opportunity for the Manager/Supervisor to present appropriate corrective action to improve a staff member's performance while giving them an opportunity to be heard and to correct the problem. Back by popular demand from #SNIC19! Ready to roll your way into the hearts and minds of your school community? Discover how a small Georgia district used a food truck to gain greater participation, awareness and acceptance among students and other stakeholders. Buckle up for a mad dash through purchasing, funding, menus, staffing and more implementation strategies. The next big innovation is here…coffee as a reimbursable meal! Yes, it can be done. Hear about the exciting pilot program Orange County Public Schools developed to serve kids the coffee they crave while maximizing the nutrients they need. Schools are no longer locking into the traditional 5-day week schedule. Some districts are exploring the benefits of a 4-day school week, such as allowing for more flexibility with teacher schedules, reducing busing and energy costs, and even focusing Fridays on sports only. But what does this mean for your school nutrition operation? Learn how to help your team and your students thrive in a 4 day school week model. Shhhhh! It's a Secret (Diner)! When you visit the lunchroom, everything seems to be complying and working efficiently... but that's not what your data shows. What's happening when you aren't there? Discover how a Secret Diner Program can give you a unique look at your operation and provide valuable feedback to help you make improvements to food quality and customer service! Back by popular demand from #SNIC19! The concept of feeding hungry kids when school is out is a no-brainer. The practicalities of doing so? That’s another thing. How can you be a summer feeding innovator in your community and reach more kids with the meals they need? One director shares her secrets to launching and expanding a successful summer feeding program. Calling all directors from small districts! As a small district, you know that you need to make the most of all available resources…especially human resources. Join Laura Lynn to learn how to include managers and kitchen staff in the broader decision-making process so that your small team is empowered to do great things. For nearly three decades, Prince William County Public Schools (Va.) has held a successful Annual Food Show, testing recipes and food items for the upcoming school year with a thousand students, parents, school staff and community members. Walk away with a step-by-step guide to hosting your own food show that will engage your guests, while promoting your program. Students with Food Allergies: What Do They Want? How can you better serve students with food allergies? Learn how to meet the needs of your students with dietary constraints based on outcomes of a student round table discussion at a recent Food Allergy Research & Education (FARE) conference.